Beautiful outdoor sanctuaries aren’t just for the privileged suburban lifestyle of wide-open spaces and acres of land. With the desire to live closer to cities, the square-footage cost increases. More and more people are looking to make the most of the space they have and this is why small-space oriented design concepts are so sought after. The rule of thumb is to utilize all of the space you have without over-crowding. Any small space can be morphed into the perfect grilling area, entertaining space, or tranquil nook. With limited space available, outdoor lighting is best mounted on existing wall space or draped string lights overhead create a romantic ambience to your outdoor space. If you have a larger area to work with, a fire pit is great addition to enhance any outdoor space. The most difficult task of creating the perfect outdoor space is trying to incorporate furniture, whether it is seating or a small table, without crowding the area and making it impossible to be comfortable. Try using a round table instead of a square table. This will allow that tiny bit extra room for a chair or two and to be seated comfortably without the sharp edges of a square table to maneuver around. You would be astounded by the contribution a small hanging table can make to your outdoor setting. Typically these are not permanent and can be taken down and stored when it is not in use. If you have a balcony, there are also tables that clip on to the railing. This creates a wonderful surface to utilize when entertaining guests to hold drinks or food spreads. The hanging table even makes a great outdoor desk for your laptop or books. When it comes to outdoor seating for your space, the obvious selection doesn’t always need to be chairs. Small one to two person benches are a nice touch. Enclosed benches double as a great outdoor storage space and seating when entertaining guests. The benches can be upholstered or even a wooden or metal bench that pillows can be added to for comfort. In small spaces, a little bit goes a long way. 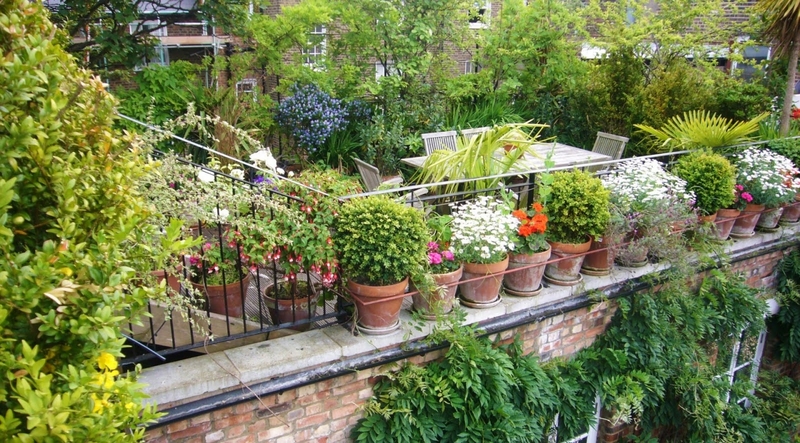 Try to avoid adding grounded flower pots, small statues and decorations that take up available walking-space. Instead, a small potted plant on the table, hanging plants or even mounted baskets on the exterior wall to hold fresh flowers will go a long way into morphing your small space into an ideal patio. Add a small rug with a pop of color to really pull the design together. Little colorful accents here and there, such as painted pots or a colorful small table, really helps to bring the indoors outdoors. Whatever you decide you want your small outdoor space, keep it simple. Varying weather conditions and upkeep can be more strenuous if your outdoor space starts to become too cluttered. Never underestimate the outdoor space you have. No yard? No problem. Any space, large or small can be turned into the perfect space with the right design.